Laura DeLuca This offer good online AND in-store. Expires 11:59 PM CST Thursday, 1/25/2018 Cannot be combined with any other voucher, coupon, or offer. 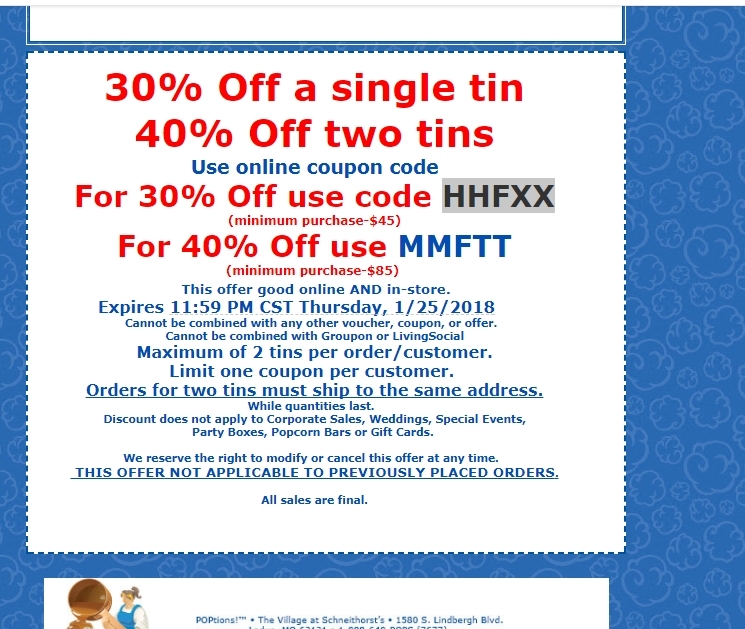 Cannot be combined with Groupon or LivingSocial Maximum of 2 tins per order/customer. Limit one coupon per customer. Orders for two tins must ship to the same address. While quantities last. Discount does not apply to Corporate Sales, Weddings, Special Events, Party Boxes, Popcorn Bars or Gift Cards. We reserve the right to modify or cancel this offer at any time. THIS OFFER NOT APPLICABLE TO PREVIOUSLY PLACED ORDERS. All sales are final.